The January/February 2017 issue of Sports Destination Management’s bimonthly magazine features John Sadler’s article, “Insurance Basics: What You Need to Know.” SDM is a trade magazine for sports event managers and organizers. 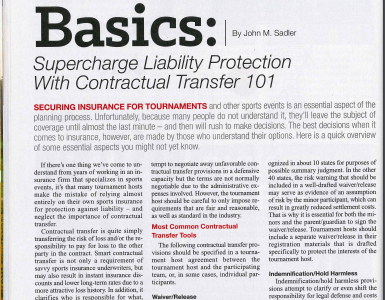 In the article, Sadler explains why it’s important to address insurance needs while planning tournaments and other sporting events. In his over 25 years in the sports insurance industry, Sadler has seen many tournament hosts rely almost entirely on their own sports insurance for protection. Too many of these hosts are unknowledgeable about or neglect the importance of contractual transfer, which is transferring the risk of loss and/or the responsibility to pay for loss to the other party in the contract. Sadler points out, however, that contractual transfer doesn’t replace tournament hosts’ needs for their own insurance and lists the reasons why. The article also discusses at length the most common contractual transfer tools, such as liability waivers/releases and indemnification/hold harmless provisions. Also covered in the article are insurance requirements for teams participating in tournaments and the importance of specifying the areas of responsibility for both the tournament host and the participating team in terms of operational control. Sadler stresses that a well-drafted provision in the tournament host agreement can be helpful to clarify which party has operational control and resulting liability.